April 19, 2018 — Over 500 Latin American artists have publicly endorsed the Palestinian call for a cultural boycott of Israel. They pledged not to perform or exhibit in Israel and to decline Israeli funding, until Israel respects the comprehensive rights of the Palestinian people under international law. The signatories include poets, painters, rappers, theater directors, filmmakers, actors, writers, and musicians from 17 Latin American countries. Among the most prominent artists are Chilean writer Lina Meruane, Colombian photographer Jesús Abad Colorado, Argentine rapper Daniel Devita, Colombian band Doctor Krápula, Chilean writer Carlos Labbé, Brazilian cartoonist Carlos Latuff, Colombian actor Álvaro Rodríguez, and Colombian theater director Patricia Ariza. In a video message, Palestinian filmmaker May Odeh and Palestinian poet Remi Kanazi thanked their Latin American colleagues for supporting the ethical, rights-based movement for a cultural boycott of Israel. Video de agradecimiento de Palestina a artistas de Latinoamérica. 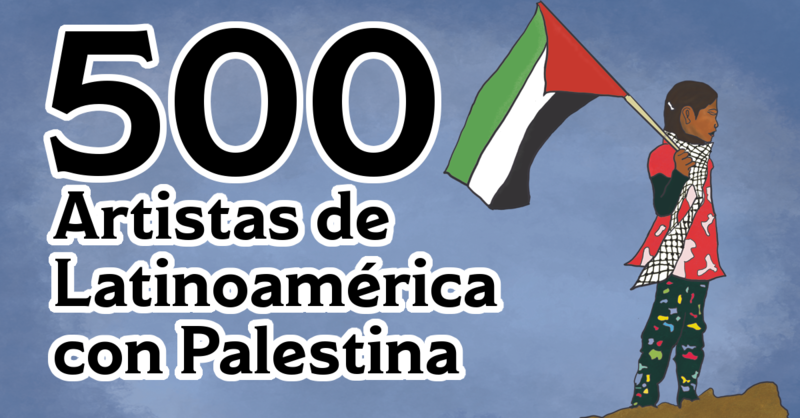 Respuesta de artistas de Palestina a la carta que el 14 de abril del 2018 lanzaron más de 500 artistas de toda latinoamérica. Emociona ver como los y las palestinas responden a este gesto que significa un avance significativo dentro de la campaña de Boicot Cultural. Puedes consultar la carta de América Latina en este link: https://bdscolombia.org/boicot-cultural/carta500/ Gracias May Odeh y Remi Kanazi! Israel uses culture to present itself to the world as a liberal democracy when, in reality, Israel, on top of being a system of military occupation and apartheid, violates Palestinian cultural rights through the destruction of theaters, the closure of cultural centers, and the arrest of artists. Thousands of cultural figures and artists across the world have heeded the Palestinians’ call to refuse business-as-usual with Israel, including Naomi Klein, Mira Nair, Roger Waters of Pink Floyd, the late Stephen Hawking, Lauryn Hill, Ken Loach, Danny Glover, Brian Eno and Chuck D.